The Tsodilo Hills are a little inselberg in the Kalahari sands in western Botswana. 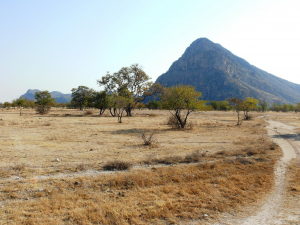 There are 4 hills: Male (1400m - one of the highest points in Botswana), Female, Child and unnamed. Being the only hills for miles and miles, it has some plants unusual for the local area, so worthwhile collating and documenting. That also explains the proliferation of paintings and human presence. The Tsodilo Hills are a UNESCO World Heritage Site (since 2001) due to its rock art with over 4500 paintings in the hills, some apparently dated to 24,000 years ago. It has religious and spiritual significance to the local San. There is a campsite and locally guided tours.